Welcome to the Cambodia Land and Environment Atlas and Resource (CLEAR). This website provides access to a broad range of land and environment data collated for Cambodia. This information is provided as thematically bundled files that can be opened and viewed using the aWhere Desktop software. Both the software and the data are provided free upon in the downloads section below. This project was funded through a grant from AusAID through the Australian Centre for International Agricultural Research (ACIAR) to Industry & Investment NSW, Australia and is associated with the Cambodia Agriculture Value Chain Program (CAVAC) in Cambodia. 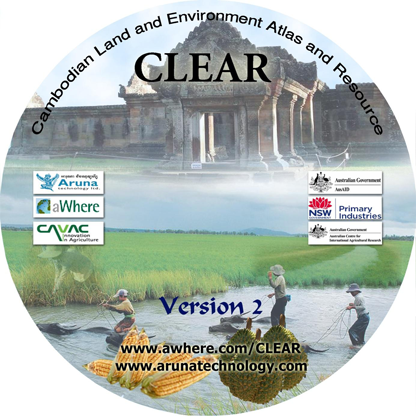 Aruna Technology, a private GIS company in Cambodia is closely associated with CLEAR. If you need any support we have a team of support personnel standing by to assist you and any feedback and suggestion are most welcome so please Contact Us. The Cambodia Land and Environment Atlas and Resource (CLEAR) site is funded through a grant from AusAID through the Australian Centre for International Agricultural Research (ACIAR) to Industry & Investment NSW, Australia and is associated with the Cambodian Agriculture Value Chain Programme (CAVAC) in Cambodia. Aruna Technology, a private GIS company in Cambodia is closely associated with CLEAR. aWhere Inc. provides software development, maintenance and support in collaboration with Aruna Technology.